This Masters player-by-player guide, and the corresponding Masters preview, have been produced with the same principles that have gone into developing the Infogol football app. Using data analysis, we objectively assess the chances of each and every player. Unfortunate to miss the 2017 Masters when playing some of the best golf in his life, which saw him reach world number 1. Last four wins have been by a combined 22 strokes, most recently the WGC Mexico Championship, beating Rory McIlroy by five. Three top 10s in the last three starts at Augusta and comes here playing just about as well as anyone. Chasing the career Grand Slam. 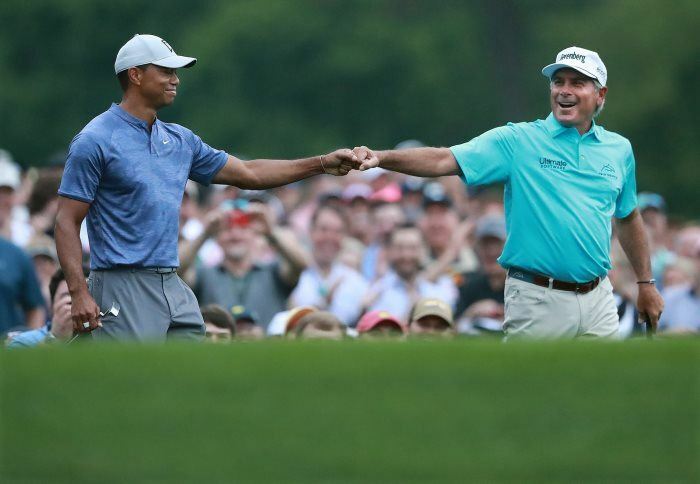 Had gone over a year without a win prior to the 2019 Players, where he showed signs of returning to the level he reached in 2014, when winning his last two majors. Threatened last year before faltering in the final round to finish T5. Runner up here 12 months ago (his eighth top five finish in a major) his best to date, making a charge on Sunday. Has all the tools to don the green jacket one day and comes into this year’s event having already tasted success this season, winning the Waste Management Phoenix Open. Has developed into one of the best in the world, and though yet to challenge at Augusta in three starts, has improved with each, best finish (T17) coming last year. Has started this season well. Enjoyed superb 2018, consistently excellent performances leading him to become world number 1 and win the Fed Ex Cup. Has a solid recent record at Augusta, runner up in 2015 and 2017, continued 2019 where he left off last year. Bagged two of last year’s majors, which helped briefly propel him to world number 1. Not quite in the same form at the start of this campaign, though decent performance in the Honda Classic last month, and form has peaked in the majors. T33, T21, T11 in three starts here. Has cemented his position towards the fore in the betting market on a weekly basis despite never having won a PGA Tour event. Brace of top-five finishes last month means he’s in better form than most, and though he has managed to break par only once in six rounds here, looks likely to remedy that this year as it’s hard to fault his all-round game. Has found his way into golf’s elite after a fast start to the season, winning the WGC-HSBC Champions and the Sentry Tournament of Champions. Made the cut last year and subsequent top 10 finishes in The Open and US Open confirm he’s capable at the highest level. Transformed himself into a worldwide-winning machine, tasting success an incredible five times between June 2018 and January 2019. Form has understandably levelled off since, but he’s had a couple of sighters at Augusta and he won’t leave any stone unturned in his preparation for this. Went close here in 2011 and 2013. A solid start to this season (three top 10s) may be the springboard for a big performance here. Has quickly made up into one of the world’s best and showcased his talents with a fourth-place finish here last year on just his second outing at the course, overcoming a slow start to shoot three rounds under 70, including a 65 (gaining over six strokes on the field) on Saturday. Shot a first round 69 on his debut here to showcase his talents but has missed his last three Masters cuts. Finished last season with his best ever major finish (6th in PGA Championship) and has been in solid form so far this season. Impressive debut at Augusta last year with a top 10 finish. Has maintained a decent level of performance over the last couple of years to see him close in on the best in the world, but last win came in 2016 (lost playoff to Xander Schauffele in the WGC Champions in 2018). Not playing quite as well as he was back in 2017 when winning the Bridgestone Invitational and the Phoenix Open, but has started 2019 nicely and has played well at Augusta in the past, scoring average of 71.6 leading to four top 20 finishes in his last five years (missing the cut in 2014). Tiger Woods heads across the Hogan Bridge on the 12th hole, during a practice round. After a long period of injury struggles, Woods is as short as 12/1 to make it five titles in 2019. Plagued with injuries, eventually undergoing spinal fusion surgery, but went close in a couple of majors before rounding his comeback season off with victory in the 2018 Tour Championship. Only played here twice in the last five years, but is a four-time Masters winner who was rarely out of the top 10 before his injury troubles. Continued good performance in 2019. 2012 US Open winner but has never really convinced around here, best finish T20 2018. Certainly wasn’t winning a major out of turn (four-time runner-up) when donning the green jacket in 2017, finally overcoming Justin Rose in a play off. The meltdown (13 on par five 15th hole) suffered on the opening day last year will take some getting over, and he’s had his share of controversy since. Took an age, for one of his ability, to finally break his major duck, but he can now boast five victories at the top table, three of which have come at Augusta (latest in 2010). Has had a couple of near misses in this since and while he’s long since been unpredictable, a quiet spell coming into this is less of a concern than for others. Quiet couple of years in 2015 and 2016, followed by a resurgence in 2017 and 2018, eventually winning the Houston Open in 2018. Has started 2019 well, T3 in the WGC Mexico Championship, albeit 5 behind McIlroy and 10 behind Johnson. Three top 10 finishes in last ten starts at Augusta. Leading amateur back in 2012 who missed the cut last year. This will be just his seventh major as a professional, with his best finish coming at the Open (T12). Generally a reliable and consistent player, despite missing a couple of cuts recently. Talented 23-year-old who shot a first round 69 on his debut last year, finishing T32. Could be an interesting top 10 contender if he can hold it together. Has struggled for form and consistency for around a year, but has a Masters record that is second to none over the last five years, victorious in 2015 and a further three top five finishes sees him boast the highest average (adjusted) strokes gained, 3.3, at Augusta in that time. Hard to weigh up and have any confidence in. Consistent player who has been much more prolific of late (twice a winner already this season) and has four top 10 finishes to his name at Augusta. Very solid. Yet to break 70 in six rounds here (scoring average of 75.0), just making the cut last year, before closing with a round of 70. Not quite playing his best in 2019 so far. Boasts an impressive Masters record, including five top 10s, a hole in one and donning the green jacket in 2013. No longer one of the worldâ€™s premier players at 39, but a new-found confidence in his putting may see him feature. Modest Masters record over last five years (missed 2015 and 2016) but more promising signs last year when T20. Converted good performances to wins in 2018, including nerveless success in The Open, before being the stand-out player in the Ryder Cup. Superb final round to win the Arnold Palmer Invitational last month, and currently at the peak of his golfing career. Missed first three cuts at Augusta before being beaten in a playoff in 2012. Has made the last five cuts, finishing T12 last year. Steady start to 2019. Closed out both European Tour wins strongly (rounds of 67 and 65) and, following solid efforts at the Honda Classic and the Players, showed plenty of mettle with run to semi-final of WGC Match Play recently. Making Masters debut. 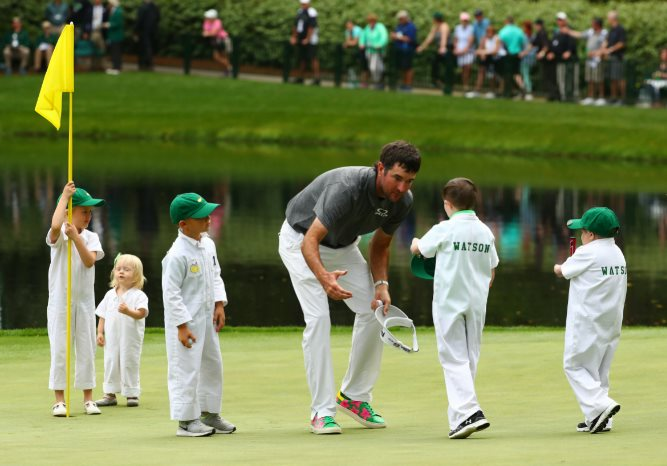 Bubba Watson greets his son on the 9th green during the pre-Masters Par 3 Contest. Two-time Masters champion (second win coming in 2014) who finished T5 last year. Isn’t the most consistent player but clearly enjoys Augusta, and has started 2019 well. Has been in good form all season and proved that by successfully defending at the Valspar Championship last month. Has the fifth-best average (adjusted) strokes gained at Augusta over the last five years and should be in the mix come Sunday. Consistent player who has declined in recent years since winning the 2014 Fed Ex Cup, and has never quite performed at Augusta, scoring average of 74.2 over the last five years. Won 2018 BMW Championship in a much-improved season, 10th WGC Mexico Championship best effort so far in a more inconsistent 2019. T22 in 2015 his best effort in five previous starts at Augusta. Yet to win on PGA tour, but five wins elsewhere, including 2017 Scottish Open. Consistent, both in terms of ball-striking and performances, and should make the cut again, but faded after a fast start last year. Won French Open and had four other top 3s in excellent 2018 season. Long way below that form so far this year, though, and yet to make the cut in two starts at Augusta. Shed his maiden tag in the Byron Nelson last season on his way to being crowned Rookie of the Year. Makes his Masters debut. 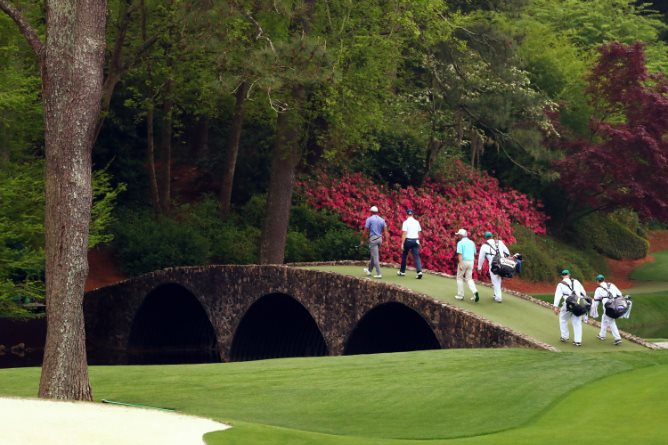 Missed last year’s Masters, and failed to make it to the weekend the year before. Has a low round of 66 (his only sub-70 round) and high of 85 in the last five years at Augusta. Hadn’t threatened at Augusta prior to his breakthrough win in this last year, comfortably outgunning final round partner McIlroy. Struggles in 2019 well documented and swing changes have ensued, so follow-up expectations probably modest. Has finished ninth and fourth here before, but also has three missed cuts to his name. Has been in solid, if unspectacular, form so far this year. Has had few chances in majors, best finish in The Open (T6 in 2018). Finished T3 in the Players last month with a closing round of 66. Not the most consistent in the field, but could outperform the usual expectations of a Masters debutant. Up-and-coming Australian who won back-to-back PGA Championships in his native country in 2017-18. Partnered Jonas Blixt for sole US success in the 2017 Zurich Classic. Marked progress on second Augusta visit when fifth last year, closing with a 66. Has shown gradual improvement over the last few years, made the cut here in 2018. That improvement has stalled in 2019, though, playing poorly and missing cuts. Winner of the Wyndham Championship in 2018 when shooting a 59 in the opening round, earning himself a spot back at Augusta having missed out last year. 2018 was a season of inconsistency, but has started 2019 better, only missing one cut. 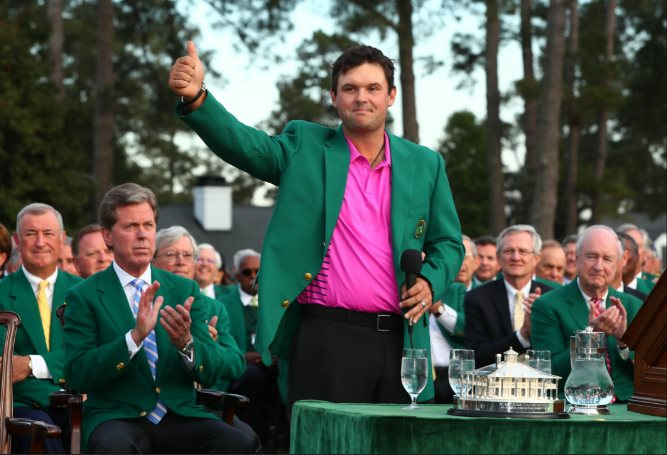 Reigning champion Patrick Reed dons the green jacket in 2018. Bookies make him 50/1+ to repeat the feat this year. Won weather-affected 2007 Masters and otherwise modest record at Augusta with only one other top 10 from 14 starts in all. Steady form in 2019 but never really in contention, best finish T24th Valspar Championship latest start. T6 2013 on Masters debut after an opening round 78 (T44 in 2014 on only other start). Started 2019 in not quite the same form as he ended 2018, but decent chance of making the weekend. Five European Tour victories in the space of four years, and has performed well on the PGA Tour this season. Tidy and consistent player who already has a solid record at Augusta, 72.9 scoring average, low round of 67 and a best finish of T7 in 2016. Gained late entry with victory in the Valero Texas Open, back-to-back 66s on the weekend sealing the win. Missed the cut here in 2015. Won the Honda Classic and T6 in Arnold Palmer Invitational on following start. In-and-out record overall but win plus four top 10s in his rookie year a fine achievement. Makes Masters debut. Very consistent performer who landed the RSM Classic in November to break extremely long winless run, and has continued in good form since. Ninth Masters but first since T19 in 2012. Achieved a Masters-best T5 in 2018, but has struggled in stroke play events in 2019. Has a solid chance of making the cut, but will need to find his 2016 Open best to feature on Sunday. Won Abu Dhabi Championship in January however form on the PGA tour since has been poor. Missed the cut on two of three Masters to date. 2017 Players champion is talented but inconsistent, having a good spell to start 2019 with three big top 4s. Making third start at Augusta, better effort T24 in 2018. Not been seen on the PGA Tour since finishing T39 in the WGC Mexico Championship. Makes Masters debut. 2011 Masters champion and who was third in 2017, though has missed the cut in three of the last five Masters. Erratic form nowadays and has also missed the cut in five of nine starts in 2019. Won Genesis Open in January, but mostly poor form in 2019 otherwise. T4 in 2016 his best finish in four starts at Augusta. Recent WGC Matchplay winner who has made the cut on all three previous starts here. Lack of length off the tee could be a drawback, but clearly in good form at present. Successfully defended Open de Portugal in 2018, and since added three more European Tour wins. Transferred form well to PGA Tour this year, making the cut on all six starts, including T6 in Arnold Palmer Invitational. Making Masters debut. 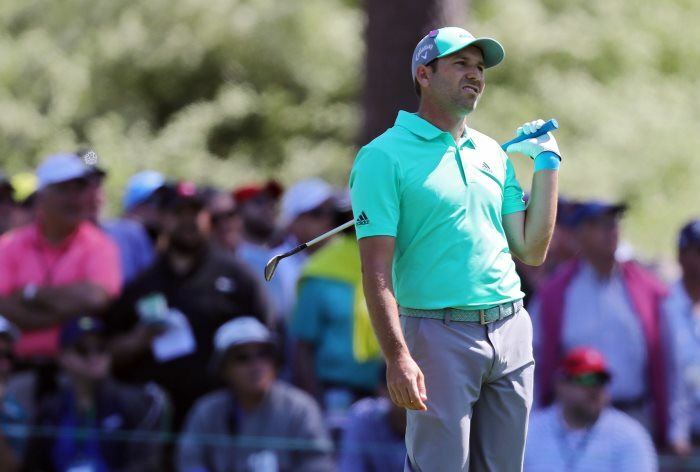 2017 winner Sergio Garcia after hitting his shot into the pond on the 15th hole, during his first round 'meltdown' at last year's tournament. T17 2016 on Masters debut, slow start a year later and failed to qualify for 2018. Started season well but form tailed off recently, not very consistent and hard to know what to expect. Made each of the last five cuts at Augusta, best finish (T8) coming in 2014, but lowest round just 70, will need to go lower if he’s to challenge. 2009 Open champion who had respectable Masters record in his heyday. Qualified for the first time since 2014 after a good run last summer, but recent form is poor. Hasn’t broken 70 in two previous Masters though some signs of promise, making the cut on each occasion (T15 on debut). Third WGC Mexico Championship only top 10 in 2019 to date, though. Improving and in good form, successful four times in Africa/Asia in 2018 and on European Tour this year, won Qatar Masters in March and 2nd Kenya Open the following week. Little experience in majors and makes Masters debut. Won Valero Texas Open in April 2018, without a top 10 since July but playing slightly better of late, makes Masters debut. Won first PGA event in 2018, and showed steady improvement over the last couple of years, but hasn’t started 2019 in the same form. Making Masters debut. Consistent performances at the Masters over the last four years, a decent scoring average of 71.7 at Augusta in that time, best T9 in 2015, with a low round of 65. Performance in Valero Texas Open a positive, but had been badly out of form prior to that. Consistent player over the last couple of years, recording some good finishes in majors, but yet to threaten at Augusta, having missed three of last five cuts. Surprise winner of the 2016 Masters who has struggled since, missing the cut in the last two Masters. Arrives playing better this time round, albeit still some way below 2016 level. Two-time major winner and former world number one but has never been suited by this test, missing the cut on five of his 11 starts. Has struggled since winning 2018 John Deere Classive, missing his last eight cuts, and looks sure to struggle again now making Masters debut. Won Desert Classic earlier this year, but followed that win with five missed cuts, before a strong finish (T10) in the Arnold Palmer Invitational. Making Masters debut. 2000 Masters champion who featured in the top 10 regularly in the 2000s, but struggled in last five visits. Missed the cut on Masters debut last year, and likely to find it tough again. 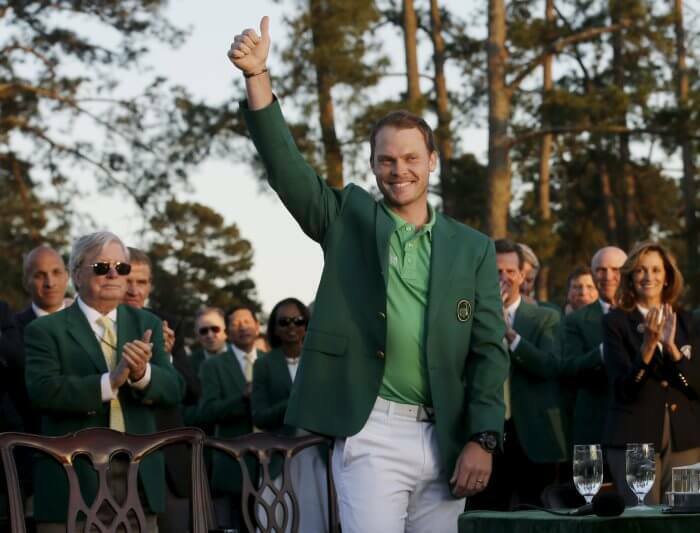 Englishman Danny Willett salutes the crowd after winning the 2016 Masters, having started the tournament as a 125/1-shot. Promising Masters debut last year, making the cut and finishing T28 (72.0 scoring average), but faces a battle to make the cut on recent form. 2009 Masters champion who has broken 70 just once in the last five years at Augusta (scoring average of 74.6), and missed three of last five cuts. 1992 Masters champion who has respectable scoring average (73.1) for last five years (missed 2016 Masters), including two top 20 finishes. Two-time Masters champion, scoring average of 73.3 for the last five years sees him mid-pack (despite missing two cuts). 2008 Masters champion (beat Tiger Woods), whose scoring average of 76.5 for last five years has seen him miss every cut. 2003 Masters champion who has failed to make the cut the last four years. Only Ian Woosnam has a higher average score over the last five years. 1994 and 1999 Masters champion, who hasn’t made the cut since 2014 (missed 2016 Masters). 1991 Masters champion who has failed to make the cut in his last ten visits (highest scoring average in the field of 77.1). 1988 Masters champion who missed four of the last five cuts. 1987 Masters champion who has fared better than some past champions, having made three of last five cuts.